Posted in Blog, MTB for families on 7 October, 2018. Posted in Family Adventuring on 19 August, 2018. We’ve spent a fair amount of the last few years travelling and exploring using a caravan and more latterly a motorhome, and whilst we thoroughly enjoyed the experiences (we try and look for the positives in anything we do) our preferred way to spend time in the outdoors is under canvas. So, this summer, we all opted for a holiday in the UK that would give us plenty of time camping. For us, camping offers a closer connection to the outdoors, and we love that. Not only do you hear the environment more easily (a running stream, owls at night, or a snoring neighbour or a nearby road which can sometimes be a reality) you are also more at one with the cycle of day and night. This usually means going to bed earlier and waking up earlier, and as long as you are comfortable, this can mean more sleep – and more often than not for us – a better quality of sleep; there’s nothing better than being snug in your rucksack with the night air on your face (although this may not be everyone’s cup of tea). 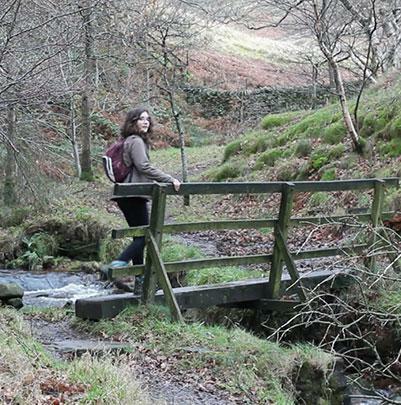 more outdoor time and enjoyment of views of natural landscapes and features (good for the mind, body and soul). 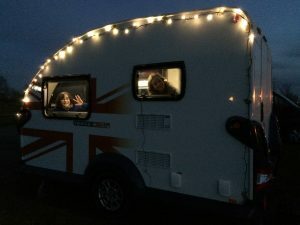 Camping in the UK – what about the rain? OK, camping is not everyone’s favourite way to spend precious holiday time, particularly in the UK when the weather can be unreliable. It’s true, camping can be a pretty miserable experience if the majority of the time is spent huddled in a damp tent, cold and hungry – and the rain is so heavy that no-one wants to venture out and start making food. But with a bit of preparation – the right kit, different options for food (packets, one-pot meals, snacks or even pub grub) and good knowledge of what there is to do if the weather isn’t great can really make a difference as to how much you enjoy the experience. And mentioned earlier was flexibility; camp sites can be paid for on a daily basis allowing for either short stops before moving on or the ability to pay daily to ‘see what the weather’s going to be like’. If the forecast doesn’t look conducive with your plans, change your plans! As an example of this, our recent plans to travel from Skye to Lewis changed quite drastically: as everyone south of Skye was enjoying a heatwave, we had nine days of predominantly windy and wet conditions… the campsite was getting waterlogged and when we were due to head to Lewis for 9 days of wild camping, the forecast suggested we were due for more heavy rain and gales. There was no point in continuing with our plan – wild camping on a remote island with little prospect of getting out of the tent, never mind seeing a view, would probably see us getting a bit fed up. So, we cancelled the ferries and decided to camp on Skye for a little longer before renting a simple cabin on the mainland for a change of scenery and new options. This turned out to be a good decision as it rained every day and we had some very strong winds blow through. We’re back home now, and whilst the cabin accommodation was enjoyable and allowed us to dry out, this trip hasn’t dampened our love of camping, and we can’t wait to get out under canvas again in the near future. Hopefully one day, we’ll complete our wild camping adventure on Lewis and Harris. If you are new to family camping, Halfords have produced a super little online guide. It’s got advice, tips and ideas… Kerry has even contributed some of our favourite camping meals. Posted in Blog, MTB for families on 25 June, 2018. Mountain Biking can be a great way to get the whole family enjoying the outdoors. Yet as a beginner, and for families with young children, it can be a challenge to work your way into this world. Our advice (as a family of ‘leisure cyclists’) is to start flat! Hills and young children don’t really go together, so get them off on the right pedal by making your route flat. The less of an incline, the more inclined the kids will be to get on and start (and keep) pedalling. 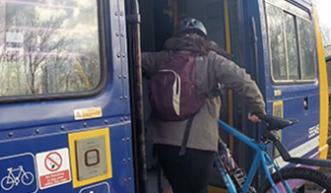 There are numerous bike trails around the country created from disused railway lines. They make ideal family trails because they are reasonably flat and traffic free. One such trail, near us, is the Tissington Trail, a former railway line connecting Ashbourne to Buxton, in the Peak District. It runs for 13 miles from Ashbourne in the south to Parsley Hay in the north. The dusty, crushed limestone surface inclines slightly as you travel north. Over the years, we’ve done it in various ways, depending on the age and ability of the kids as they’ve grown up. There are numerous stopping points along the route which allow for breaks but also change-overs, meaning the route can be completed as a whole journey in small chunks, with a vehicle for support. As a family of four, this meant that we completed sections in pairs (one adult and one child) while the others drove to the next stopping point before swapping. Then as the children got older we’d complete longer sections, i.e.one pair would do the route south to north while the other did the return leg. As older and more confident cyclists, the kids were then able to complete the whole route from Ashbourne to Parsley Hay and back. There is also the possibiltiy of extending the route further by then joining the High Peak trail – the options are endless! Posted in Blog on 18 January, 2018. Posted in Blog, Clear Plastic Bottles, Project: Base Camp, Refuse 4 Ever, Winter on 2 January, 2018. Posted in Blog, Clear Plastic Bottles on 28 December, 2017. 65, 590 pieces of plastic (the big 4 polluters) collected to date! We’re aiming to pick up 100,000 plastic bottles, lids, cups, straws (and microplastics) from all around the globe – beaches, forests, road-sides, anywhere we find them. Why 100,000 – this is the number of sea mammals killed each year from being trapped in plastic or eating it. More about the campaign – which anyone can be involved with – is on the Kids Against Plastic Website. 26.6.18 Joined a beach clean on Woolston Beach near Southampton and collected 496 pieces of plastic litter. 24.6.18 Another litter pick whilst running and cycling in Sherwood Pines and another 65 to add to the total. Thanks again to Ava and Jack (along with a few other helpers!) for adding 200 more to our total. Thanks to the Davenport family for their pick up which included 80 plastic bottles. Thanks to the Bayman family for their pick up of 600 pieces of plastic in their local village. Joined a local litter pick and can add another 100 to total – a lot of which was collected outside McDonalds! May bank holiday pick up at the Yorkshire Three Peaks. 1050 to add to the total. 378 picked up at Attenborough Nature Reserve and along the Trent. 19 pieces picked up on Gedling Borough Park. Another 21 from the wonderful Astrid Shepherd. 12.4.18 1332 pieces picked up on a short stretch of Cleethorpe beach! 4.2.18 Went for a short walk near our house and collected 156 pieces of plastic in less than half an hour. 28.01.18 A huge thank you to the Auckland family for going out and collecting 476 pieces of plastic litter. 23.01.18 Many thanks to Zoe Holland and family for their pick up of 53 pieces of plastic litter. 01/01/18 The first pick up of the year. Whist out on a run collected 267 pieces of plastic on the second lap. 30.12.17 Thank you to fellow Kid Against Plastic Charlie (Charlie’s Quest to Save Our Oceans) for collecting 151 pieces of plastic litter. 30.12.17 Caught the bus into the city centre and then walked home, collecting litter along the way. Bagged another 876. 30.12.17 A massive thank you to Lily (https://www.facebook.com/lillysplasticpickup/) for contributing to our total adding another 1619. She is doing an amazing job of picking up plastic! 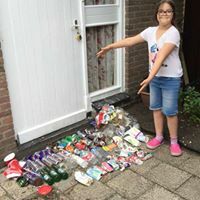 Thank you to Kirsty Cavill, one of the Kids Against Plastic supporters, for another contribution of 318 pieces of plastic. 29.12.17 Spent an afternoon walking around the local area and picked up 876 pieces of plastic beverage litter. 30.12.17 Thanks again to the Triggs family for collecting 7 bags of litter with 42 pieces of plastic to add to the total. 30.12.17 Thank you to Gail for collecting 72 pieces of plastic from Aberporth beach. 30.12.17 Thank you to Georgina Stevens for collecting up litter as part of a beach clean and adding 6 to our total. 30.12.17 Thank you to Glen Pilkington for going out in the dark and helping us to reach 50,000 by collecting 57. 30.12.17 Thanks to Jen and Sim for heading out on a ‘rubbish run’ and collecting 26 plastic bottles. 30.12.17 Thank you to Sarah and her two daughters for collecting 43 bottles from their local woods. 30.12.17 Thank you to Tillie and Hatty for collecting 3 bin bags full of rubbish, including 136 beverage plastic items. 28.12.17 After a full day of litter picking, stopping at various locations to pick up other people’s plastic rubbish we managed to collect a whopping total of 2,151 to add the the total. Thanks again to Donna Rainey for more litter picks and adding another 668 to the total. Thanks to staff and kids at Derrymount school for collecting 300 pieces of plastic to add to the total. 26/11/17 Returned to a hotspot in central Nottingham and picked up 562 of the big 4! 19.10.17 Got the kayak out again and picked up litter from a canal in Yorkshire. 117 to add to the total. 5.11.17 Went for another paddle on the River Trent and collected and removed 137 pieces of plastic litter. An amazing 783 to add to the total from Newquay Beach combing. 14.10.17 Another trip to Sherwood Pines to walk the trails and pick up the plastic litter. 257 to add to the total. 24/09/17 After a run and cycle in Sherwood Pines, we picked up 183 pieces of plastic litter, mainly bottles and coffee cups left by people using the cafe. Thanks again to Jason Rawles for adding more to the total. Another 76 bottles. 17.09.17 Collected litter whilst paddling along the Trent. Along with an array of bits and bobs collected 250 pieces of plastic. 16.09.17 Inspired after the girls talked at The Good Life Experience festival, this little girl went and picked up litter at the festival and collected 5 pieces inc the bag. Super star! Jason Smith @ChallengerWSM. 3 men on a boat for four days collected 147 plastic bottles and 47 plastic bags. 27.08.17 Another beach clean on Spurn Point. Collected 1186 pieces of plastic. 25.08.17 Musselborough beach clean with MCS Scotland and Exxpedition. 100 pieces of plastic along with various other beach litter. 24.08.17 A beach clean on the very popular and clean-looking Portobello beach near Edinburgh. Collected 207 pieces of the big four. 23.08.17 Whilst walking alongside and paddling (both kayak and SUPs) on the Forth and Clyde canal we collected 86 pieces of plastic as well as many glass bottles. 21.08.17 44 pieces of plastic litter collected in the school grounds of Mearns Primary after the girls had been in to do a talk. 20.08.17 Joined locals Christina and Stella for the monthly beach clean at Arrochar, a village at the end of Loch Long that gets layers and layers of plastic dumped on it with each tide that comes in from the Firth of Clyde. Collected 2040 of the big 4 along with a lot more! 19.08.17 Garelochhead – a village at the end of the Loch Gare where the tide washes up plastic on a daily basis. We collected 1189 pieces of plastic litter to add to the total. 18.08.17 Family beach clean in Fairlie, Scotland – somewhere we passed through when walking the 100 mile Ayrshire Coastal path. Collected 42. Thanks to Dan and friends for picking up litter in Peterborough. Along with lots of other rubbish they collected 375 pieces of plastic to add to the total. 13.08.17 Another canal. This time we collected 170 pieces of the big four plastic polluters. 12.08.17 Returned to Cardiff Pointe to collect another 294 pieces of plastic litter. 11.08.17 Joined Exxpedition and Keep Wales tidy for another litter pick event at Cardiff Pointe and collected 96 bags of litter! Reckon there was at least 1820 pieces of the plastic big four! 09.08.17 Heading up the coast now and stopped to pick up litter in the Exeter canal. With two of us walking alongside and two in the inflatable kayak we collected 75. 08.08 Managed to fit in another beach clean further up the coast from Plymouth. Can you guess how many? 07.08.17 Joined Exxpedition and a group of local children to clean up the shores near Plymouth University Marine Station to collect 350 pieces of plastic litter (along with a lot of other stuff!). 6.8.17 Arrived in Plymouth and did a local pick up in the harbour. Collected 36 to add to the total. 6.8.17 Joined Plastic Patrol today and along with others on SUPs removed 64 pieces of plastic from the canal. Look at that smile! Thanks Luke and Ollie for adding another 46 to the total. Thanks once again to Jason Rawles for picking up 38 pieces of plastic litter in his local area. Keep up the good work. July 2017 Skipton academy did a local litter pick and collected 887 pieces of single use plastic beverage items – taking us over a third of the way to the total!! 25.6.17 Collected 22 bottles from the River Dove whilst out paddling. The Davies family astounded us again collecting 544 pieces of plastic! Catherine Gemmell picked up 17 bottles during a recent beach clean. Rebecca Brough picked up 2 bottles during a forest walk. 14.05.17 After a day at Trent Bridge watching the cricket we couldn’t leave without picking up some of the abandoned litter. Collected 383 bottles and cups and that was in only one stand. 14.05.17 Did another local pick up on the nearby streets. Collected 83 this time. 07.05.17 Another big thank you to Davies family who collected a tremendous 72 to add to the total. 07.05.17 Sunday evening litter pick of the local streets and we found 82 pieces of plastic litter, mainly bottles and bottle tops. 29.05.17 Thank you to the Davies family for collected 19 pieces of plastic in 15 minutes! 30.05.17 Thank you to Jason Rawles for collecting 238 pieces of plastic litter in his local area. 29.05.17 While the girls were away at Scout camp us parents went for a litter pick up along the local roads, collecting 269. A great haul from DOE girls Hermione, Helena and Charmaine – thank you! Thanks to Jo Royle for picking up 47 plastic items of beverage litter (amongst lots of other litter) whilst on a beach in Skye. 12.04.17 Just a walk in the local area and we managed to pick up 220 pieces of plastic litter. Thanks to Gavin and Kate for collecting 19 whilst out walking the dog. Thank you again to Kirsty for another 48 towards our total. Thanks to Luke and Ollie for collecting 52 plastic bottles whilst out on a canoe trip. 09.04.17 A beach clean whilst in Wales. 152 pieces found on Newborough beach on Anglesey. Another fantastic contribution of 450 from Donna Rainey. 20 plastic items amongst the bags of rubbish collected during a beach clean. Thanks to Polly Small. 02.04.17 Stopped at a layby on the A1 that had no bins and was covered in rubbish. Didn’t take us long to pick up 393 pieces of plastic. 19.03.17 Thank you to Evie (@minimatthewsontour) for collecting 7 plastic bottles on a canal walk. Thanks to @barefootaleks and runners @thebeerultra for adding 32 to the total whilst running their 6th lap. A big thank you to the Wild Brothers for collecting 16 pieces of plastic litter. 18.03.17 Another whopping collection of 1187 pieces of plastic at Spurn Point. Another thank you to Donna Rainey for collecting 120 bottles on roads near here. Thank you to Rozzy and the Duke Of Edinburgh girls who have collected 1200 so far this year. Keep up the good work! Thank you to Lena in Garvagh who picks up litter 100m from her home and collected a total of 184 in 2016. 13.03.17 Somewhere we often find litter is on the roadside, discarded by motorists. We managed to collect 1226 pieces of plastic litter by a busy road, taking us over a quarter of the way to our total! March 2017 – The Haynes family collected 1000 pieces of micro plastic on a beach in Spain during their family travels. A fantastic addition! 11.03.17 Collected 183 pieces of plastic litter whilst cycling and running 17 miles around Rutland reservoir. 09.03.17 Fellow Get Outside champion Jason Rawles has done it again! Whilst out on a walk around Lake Lyn he picked up 301 pieces of plastic. Thanks Jason. The Banks family are travelling around Europe and, shocked by the amount of plastic on Greek beaches decided to do something about it, contributing 550 to our total. A big thank you! Jan Wells (and her pooches) have been collecting litter since January and we are grateful for her contribution of 64 to our total. Once again thank you to Kirsty Cavill for another 42 pieces of plastic litter found. Thank you to Jim Newman for the 1000 plastic pieces of litter that he’s collected on the roadside near his house. 05.03.17 This was our two minute beach clean on Fraisthorpe beach. Amongst the pile of rubbish that we collected were 13 plastic beverage items. 05.03.17 Another big thank you to Donna Rainey for collecting 750 plastic bottles as well as other litter on Magilligan beach in Northern Ireland. 04.03.17 Amazing how much rubbish you can find at the side of roads. 914 pieces of plastic beverage litter in fact! 02.03.17 A local litter pick along the road and by the river. Lizzie is one of the Kids Against Plastic Ambassadors and a fellow OS Get Outside champion. She collected 1000 plastic bottles when paddling by SUP the length of England. February – you can find litter everywhere. We collected 23 on our to the Excel in London when talking at the Oceans Festival. 15th Feb Another 17 from Jason Rawles who’s aiming to collect 1000 by the end of the month! January The Outdoor Bloggers did a Big Clean Up week (20th – 27th January) and collected hundreds of pieces of plastic litter, adding 700 to our total. 1.02.17 Thank you to Nikki Triggs and family for their 38 pieces of plastic litter collected during their January litter pick. 29.01.17 26 more plastic bottles to add the total, thanks to Kirsty Cavill. 29.01.17 Picked up 587 plastic items by a busy road and there’s still plenty more to go back for! 28.01.17 Another fantastic collection from Donna of 200 plastic bottles collected by the roadside. Big thank you to Mary-Ann Ochota, Joe and Meridith for their Christmas Clean up of 60 plastic bottles – another great addition to the total. 28.01.17 Another super contribution of 27 bottles from fellow OS Get Outside champion Zoe Homes (@Splodz). 27.01.17 Amy and Ella picked up 5 plastic bottles and cups whilst out on an organised Ordnance Survey walk with fellow Get Outside champions. 25.01.17 Thank you to Craft Invaders for their latest litter pick up and another 24 to add to the total. 25.01.17 Four Acorns joined in the Big Clean Up and collected 14 plastic items whilst our on a walk. A big thank you. 20.01.17 First day of the Big Clean Up and thank you to Jen and Sim Benson (@jenandsim) for collecting 40 plastic items (along with other rubbish) whilst out on a run. 15.01.17 This is an amazing addition to the Wall of Fame. A big thanks to Donna and pals for their collection at Larne Lough. 14.01.17 Thanks to @BareFootPhotographer and Eysa (the hound) for their collection of 43 plastic bottles from Scilly Rocks. 08.01.17 @julndevon tweeted a photo of their liter pick with 11 to add to the total. Another big thank you. 08.01.17 A beautiful walk in the woods spoiled by litter. Picked up another 49 to add to the total. 02.01.17 – 25 plastic litter items collected by the Hull family (along with a load of other beach litter). A big thank you to them. 02.01.17 – Surprising how much you can find on one beach. We didn’t even make it to the end of Spurn Point and collected 564 pieces. As well as this some other volunteers on the beach collected 200 – a big thank you to them. 4.12.16 Amazing what you can find chucked at the side of country roads! 273 pieces of single plastic bottles, lids, cups and straws. 26.11.16 Picked up 22 bottles whilst out on a walk in the countryside. – most of which were found on the roadside. 13.11.16 Thanks to Kirsty Cavill for her continued support with another 61 single use plastic bottles and lids to add to our total. 9.10.16 – 1,680 pieces picked up by Matt Heason and friends during a village clean up! 101 pieces of plastic collected during a walk around Liverpool. 11.9.16 – 19 bottles collected on the way back from a Sunday lunch! 11.9.16 – 7 MORE bottles collected by Kirsty Cavill! 9.9.16 – 40 bottles collected by the awesome Polly Small and her son Frankie! 13.8.16 – 152 pieces of plastic collected on the North West coast. 5.8.16 – 68 bottles collected by Rob and his amazing son! 2.8.16 – 25 more bottles collected by the amazing Astrid. 2.8.16 – 46 bottles collected by Astrid and friends. 18.7.16 – 29 pieces of plastic collected from a park in Arnold. 18/6/16 – 11 MORE bottles collected by the brilliant Astrid Shepard, with the help of Andy McLean, Jane Attard, Becky and Mark, Luke Hull and Ollie, Dave Selby and Max Gruening. Thanks guys!!! 10/6/16 – 28 bottles collected by the brilliant Steve Blethyn!!! 30.5.16 – 191 pieces of litter found on Southport beach. 8.6.16 – 98 pieces collected from Hornsea beach. 23.5.16 – 36 bottles collected by Steve Blethyn! 23.5.16 – 16 bottles collected by the awesome Eleanor Williams! 11th May – 27 bottles, tops and lids collected on the way down from Ben Lawers. 10th May – 55 pieces picked up from lay-bys on the way from Fort William to Killin. May 2016 – 9 bottles picked up by Michelle Williams. Thanks so much Michelle! May 2016 – Ieva Balode collected 22 bottles when on the Isle of Skye. Go Ieva! May 2016 – an amazing 201 items picked up by the YES Tribers during their microadventure on the Isle of Wight. Yay! – thanks guys! 5.5.16 – 1201 pieces of beverage litter (in particular bottle tops!) collected from Strathclyde Country Park. May 2016 – 3 items picked up by the brill daughter of Eleanor Williams! 3 bottles collected by Elise Downing during her (ongoing) around the UK run! 2 bottles collected by Ieva Balode on Ben Nevis! 4 bottles collected by Eleanor Williams. A baker’s dozen collected by the brilliant Astrid Shepherd! 4 pieces of beverage litter collected by Aleks Kashefi. 171 pieces of plastic litter collected by Jason Rawles! 25.4.16 – 607 pieces of plastic beverage litter picked up from the cycle trail between Tynemouth and Newcastle. 24.4.16 – 190 pieces of plastic collected from Whitley Bay. 24.4.16 – An awesome 22 bottles collected by Elizabeth Peters. 22.4.16 – 203 pieces of beverage litter (mainly bottles) picked up while walking the Yorkshire 3 Peaks. 22.4.16 – 7 bottles picked up by Jason Rawles. 2.3.2016 – 70 pieces of litter removed during a walk in Bourg St Maurice. 9.3.16 – 300 bottles etc removed from the beach at Nice and recycled. 12.3.16 – 50 bottles collected by Astrid Shepherd on her way home from work. 15.3.16 – 245 pieces of plastic beverage litter (mainly plastic straws) picked up from Vilanova beach, Spain. 17.3.16 – 154 pieces of plastic litter picked up by the brilliant Barlow family. 17.3.16 – 89 pieces of plastic drinks litter picked up along the La Torre Del Sol beach, Spain. 18.3.16 – 6 bottles removed from a coastal path in Alcossebre, Spain. 31.3.16 – 202 pieces of litter picked up near El Escorial. 02.4.16 – 301 pieces of litter picked up in Salamanca, Spain. 4.4.16 – 20 bottles picked up by the brilliant Polly Small and her eight year-old son. Great work! 75 bottles collected by the super Alexandra Moyes and Chris Barnes. 13.4.06 – 10 bottles picked up by Jo Fretter and daughter. Well done guys. 17.4.16 – 16 bottles picked up by Astrid and Ruthie (aged 4) in separate locations but towards a shared cause. 19.4.16 – 209 pieces of plastic litter picked up near Danes Dyke. 5 bottles picked up by Astrid Shepherd. Great job! Another 7 bottles picked up by Kirsty Cavill! A brilliant 28 bottles collected by Steve Blethyn. Posted in Blog, Project: Base Camp, Triathlon 2017, Winter on 17 December, 2017. Posted in Blog on 12 November, 2017. Blacks are sponsoring Children in Need this year and this is a charity that we regularly support and try to fundraise for. Therefore it made sense as Blacks family ambassadors that we don our Pudsey hats and head for the hills for some fresh air and fundraising. Countryfile have been encouraging people to arrange sponsored rambles to raise money for the Children in Need charity. Since we love the Great Outdoors and spending time in the fresh air, we eagerly decided to arrange our own ramble but put a different spin on it. 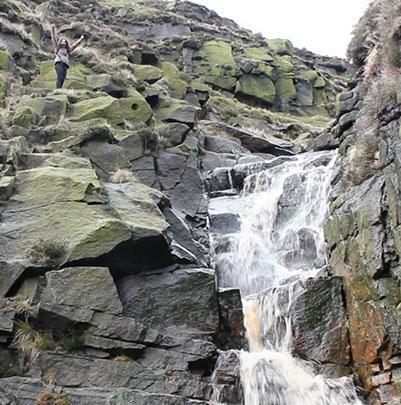 We plotted out a four mile hike across the Kinder Plateau in the Peak District to a popular hot stop called Kinder Downfall where we set up a Pudsey Pop Up Café serving free coffee, tea and hot chocolate. We sat for a couple of hours in the winter sunshine providing fellow walkers with warm drinks. Serving them in reusuable mugs meant that we not only avoided using single-use plastic but encouraged people to stop, chat and admire the view. Snowdon may have a café at the top but on this day Kinder Plateau had a Plastic Clever café at the top. This ramble was rewarding in so many ways; we enjoyed a walk in the fresh air, spent time together as a family chatting along the way, provided a service for thirsty and cold walkers and raised £59.17 for a worthwhile charity. Posted in Blog, Family adventure, Family Adventuring on 24 October, 2017. We’ve been a family who love the outdoors for a few years now, and we are constantly striving to spend as much time together outside as we can, regardless of the time of year, season or weather. Why? Well, it’s simple, really: being outdoors makes us all feel happy, and relaxed and contented. Whenever we are outdoors together we feel alive and free. And in actual fact, it was our craving for outdoor time and family adventures that was a fundamental reason why, very recently, for nearly 3 years we left the rat race (work and school) and went travelling together – by caravan and motorhome. We had great experiences together; we created shared memories that will last forever; and we helped our children to maintain a healthy balance between ‘screen time’ and ‘green time’. Sometimes the simple things re the most important. We’ve returned to a ‘normal’ life again now, but our enthusiasm for adventure and outdoor time is still alive and kicking: making us feel alive and giving us the kick we need to get outside and do more! And this enthusiasm, or passion, for the outdoors has lead us into many an outdoor retailer or distributer over the years; after all, you need some essential kit to make sure your adventures and experiences are safe and as comfortable as they can be, right? And without naming names, it is fair to say that not every retail experience has been good or better than average, never mind great. You see, as non-outdoorsy experts like us (NB. being enthusiastic doesn’t = expert), looking for clothing or equipment for an outdoor activity can be a difficult experience. After all, outdoor kit can be expensive so making the right purchase is important. Since then, and as we travelled the UK we always look for a Go Outdoors whenever we need to replace kit or buy extras. And nearly a year to the day of writing, when we arrived back from our European travels to Nottingham we were excited to see that Go Outdoors had opened a new shop very close to where we live. So, it will be no surprise to read that I’ve since made several visits in the year we’ve been back and GO have been open, whether to go in to get DofE advice for a new group a colleague have set up, price up and buy new kit for our family adventures or to just go in and browse. When the team from GO Nottingham asked me to help them celebrate the 1st anniversary of their Nottingham store, it was a no brainer. I went in to chat with the staff to learn about how heavily they invest in their staff (training and morale) to ensure us, the customers, get the service we are looking for (and our (above) shopping criteria met). And with a modest voucher to spend, I went with a particular mission to get some new footwear for every day adventuring with a key requirement being they need to keep my feet warm and dry – I was heading to an outdoor weekend festival and the weather was looking wild (Storm Brian was on his way). Sam from GO talked me through a whole range of options (how does he know about so many different shoes!) and guided me towards a reduced pair of Salomon X Ultra 2 GTX Men’s Hiking Shoes: waterproof and reduced from £115 to £85. Thankfully, after a weekend of being up to my ankles in mud and slop, my feet remained warm and dry – thanks Sam for the recommendation! The team at GO really would like everyone to help them celebrate, and leave their store on their birthday weekend with a smile on their face. Be that from the fun activities they have planned for kids: face painting and more, or the free discount card and extra discounts they are putting on EVERYTHING over that weekend. So, get yourself down to grab some bargains on outdoor clothing, equipment and accessories for a whole range of sports, including: camping, walking, climbing, cycling, riding, fishing, skiing and running. Maybe I’ll see you having a great time in the great outdoors soon? Posted in Blog on 16 October, 2017. Last weekend (Saturday 14th and Sunday 15th October) were the official days for the BBC Countryfile Ramble for Children in Need – a charity event that encouraged us to get outside and walk in the autumnal countryside. Nationwide, groups of people donned their yellow woolly hats and took to the trails. Our chosen walk was a cycle trail that we chose to revisit from the previous weekend. 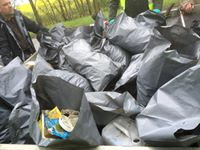 Why – because we wanted to pick up all the plastic litter – mainly drinks bottles – that had been dropped along the route, discarded by people out enjoying the environment but spoiling it for others. Hidden amongst the autumnal leaf litter we many lots of the other sort of litter in the shape of plastic bottles, cups and packaging. During our four-hour ramble we managed to pick up 257 pieces of plastic litter – another successful hoard to add to the total. No yellow woolly hats this time but they are in the post and we’re looking forward to wearing them soon for another ramble! Adventuring with Kids – 3 of 3 – Optimum time? Posted in Blog, Family adventure on 25 September, 2017. Part of being a parent involves making sacrifices. Life changes after children and some people embrace it better than others. We weren’t particularly adventurous before we had children but when the girls arrived we wanted them to have an adventurous mindset and a love of the outdoors and nature so from an early age we made efforts to get outside and do something interesting and challenging – a family adventure. Anyone who has been on an adventure with others knows that everyone has different capabilities; age, fitness, experience / confidence and mental strength can all affect how someone approaches an adventure. The same thing can be said when adventuring with children. The age of the child will affect greatly what can be done and how; younger children aren’t able to sustain strenuous exercise for long periods of time, get bored more easily, get tired quicker, need food more regularly but that shouldn’t stop us as adults involving the children. A bit of creativity and flexibility means that adventures can be done together; they might be shorter, there might be more rest breaks, the kids might need help but they can be done. Then as the children become stronger and more able to challenge themselves further, the adventures then can become longer and more challenging. Whilst running a workshop at the Basecamp festival we attempted to illustrate this with a graph! Scientifically speaking it may not be accurate, but it illustrates the differences that need to be considered when adventuring with children. Our graph very simplistically shows the abilities of an adult and a child. Adults, obviously older, have varying degrees of capability but, in comparison to children will appear much higher on the graph. The ability of an adult will also fluctuate according to fitness, age and health but will realistically gradually decline. The ability of a child, on the other hand, will increase. It is important to note that the ability isn’t just physical but also mental. In the early the years, whilst the child is learning to do amazing things such as walk and talk, their ability to go on an adventure is low but this rises with age. There will be one point on the graph when the child and adult are almost equal – this will differ from family to family. This might not be the case for everyone but this is the case for us. In the early years, we went for short walks and tailored adventures around what the kids could do. At age 4, Ella was able to walk up Snowdon but caught the train back down whereas Amy that little bit older walked up and down; their age difference meant that the challenge was adapted to suit them. Now aged 14 Amy is able to do challenges alongside adults. At age 12 she completed the Yorkshire Three Peaks challenge in 12 hours and the National Three Peaks challenge in 24 hours. We as the adults in the last decade have probably slipped down the graph and are now at optimum point where all our abilities are about the same. How long this will last, who knows since the girls will no doubt continue to climb up our graph and overtake us! So, for us this is our optimum time and we need to make the most of it! Posted in Blog, Family adventure on 21 September, 2017. We are avid magpies – stealing ideas from other adventurers and making them our own. All of us seek inspiration and we have many inspiring adventurers that we turn to for ideas, e.g. Alistair Humphreys, Dave Cornthwaite, Sean Conway and Anna McNuff to name but a few. The problem is that these hard-core impressive human beings are often doing exciting things that are beyond the realms of the every day family. Whilst running workshops at the recent Basecamp festival we attempted to impress our participants with a bit of science – graphs! This particular graph attempts to illustrate (very simplistically) the way to approach adventuring with kids. The y axis shows the length of time an activity or adventure can take, increasing as it moves up the page, while the x axis shows the difficulty, increasing as it moves right. These scales are not in anyway accurate and are relative to whatever content is put on the graph, but do give a rough impression of two areas of consideration when planning adventures. Examples of more gnarly adventures would obviously appear in the top right corner of the graph – they take time and are at the difficult end of the spectrum; these are the adventures that would be difficult or impossible to do with younger children, e.g. Alistair Humphreys’ cycle around the world in four years. The idea is to find suitable alternatives that fit in the bottom left corner of the graph initially when planning adventures with kids. The time taken and difficulty will vary depending on the age and ability of everyone in the family and this will and does change as we get all get older (see next blog post – part 3). Who knows, one day, you might end up doing an adventure in the top right corner!